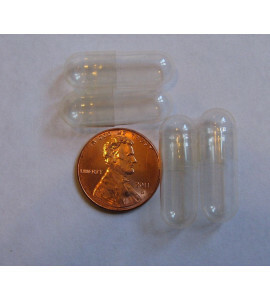 These are empty size 00 kosher gelatin capsules. They measure 8.53mm across and 23.30mm long. They hold 0.95mL, which typically works out to about 1 gram of powder if you fill both ends. The larger end holds about 0.67 grams and the smaller end holds about 0.33 grams. Empty Size 00 Capsules There are 4 products.